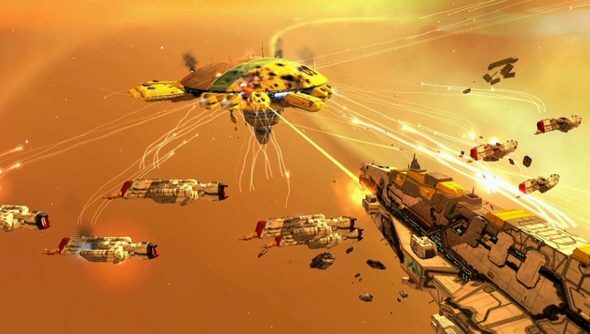 Homeworld HD, the re-release of the classic sci-fi RTS, has become Homeworld Remastered, Gearbox’s Chris Faylor revealed in a blog post yesterday. “Previously, we’d been referring to this effort as Homeworld HD but as work progressed it became clear that title didn’t properly communicate the scope of the work,” Faylor explains in the post. Along with the name change, Gearbox has also launched an official website for the game. The site emphasises the legacy of the original series, developed by Relic back in ‘99. “It is with great love and respect for developer Relic’s brilliant, fun and innovative franchise that Gearbox Software acquired the space strategy series and is championing its re-introduction to players new and old,” Gearbox states on the site. Gearbox acquired the IP last year, after THQ – the previous owner – declared bankruptcy and its assets were auctioned off. The studio is also funding the development of Homeworld: Shipbreakers, the creation of Blackbird Interactive, a developer made up from many of Homeworld’s original team. The Homeworld Remasted Collection will include support for HD and 4K resolutions, updated textures and models, new graphical effects and recreated cinematics made by the original games’ audio and video artists. A collector’s edition is also in the works, and Gearbox wants to know which of two proposed versions you’d prefer. How thoughtful.